This antibody recognizes TTF-1, a member of the NKx2 family of homeodomain transcription factors. 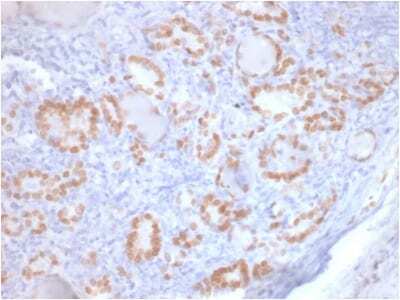 MAD109, MLE-15, H441-4, or H345 cells. Normal thyroid or lung. 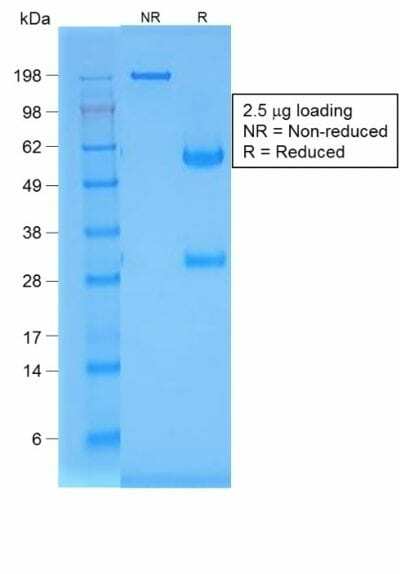 This antibody recognizes a protein of 40 kDa, identified as Thyroid transcription factor-1 (TTF-1). TTF-1 is a member of the NKx2 family of homeodomain transcription factors. It is expressed in epithelial cells of the thyroid gland and the lung. Nuclei from liver, stomach, pancreas, small intestine, colon, kidney, breast, skin, testes, pituitary, prostate, and adrenal glands are unreactive. 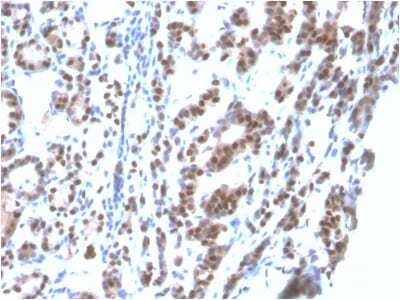 Anti-TTF-1 is useful in differentiating primary adenocarcinoma of the lung from metastatic carcinomas originating in the breast, mediastinal germ cell tumors, and malignant mesothelioma. It can also be used to differentiate small cell lung carcinoma from lymphoid infiltrates. Loss of TTF-1 expression in non-small cell lung carcinoma has been associated with aggressive behavior of such neoplasms. TTF-1 reactivity is also seen in thyroid malignancies. Catalog number key for antibody number 1853, Anti-TTF-1 / NKX2.1 (rNX2.1/690) The prefix indicates conjugation, followed by the antibody number and size suffix. Wert, S.E., et al. 2002. Increased expression of TTF-1 in respiratory epithelial cells inhibits alveolarization and causes pulmonary inflammation. Dev. Biol. 242: 75-87.